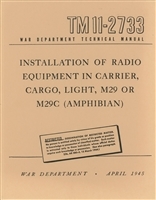 Illustrated Guide to installation of radios in M8 Armored Car. TM 11-615A for Radio Set SCR-609-A and Radio Set SCR-610-A. 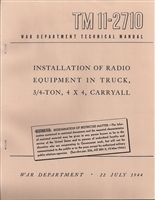 Nice reprint of manual covering radio sets commonly installed in G506/WW2 Jeep/GPW/MB. Excellent pictures with details of components of sets. Also includes operating instructions. 54 pages. Proper radio installation in all versions of Weasel. PE 95, Power Unit based on Willys Go Devil Engine. 120 pages. Signal Corps Equipment Directory from 1944. Specifications on most WW2 radios. 124 pages. 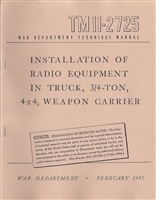 Installation of Radio and Facsimile Equipment in Dodge Truck, 3/4 Ton, 4x4, Command Reconnaissance, WC-58. This is a high-quality reproduction of the U.S. Army Signal Corps manual of WWII. Dated March, 1945. Covers Radio Sets: RC-58, SCR-193-Q, SCR-245-T, SCR-506, SCR-508, SCR-510, SCR-528, SCR-608, SCR-610, SCR-628. Detailed installation instructions, wiring diagrams, templates and more. 55 pages. Installation of Radio Equipment in Truck, 3/4 Ton, 4x4, Weapon Carrier. This is a high-quality reproduction of the U.S. Army Signal Corps manual of WWII. Dated March, 1945. Covers Radio Sets: RC-58, SCR-193-U, SCR-284, SCR-506, SCR-610, SCR-508, SCR-510, SCR-528, SCR-608, SCR-628. Includes detailed installation instructions, templates, wiring diagrams and more.